Therehas been more public furor over the demotion of Pluto to ?dwarf planet? than Ihave seen about other astronomical issue in a long time. It?s good to havelarge participation and interest in astronomy, and many folks really caresignificantly about the naming of celestial objects. In a recent sciencemeeting many colleagues discussed the naming of new extrasolar planets. Ihappened to disagree with the majority, and was surprised when a youngscientist stated, with what appeared to be frustration (and not a littleenthusiasm), the naming of extrasolar planets was already a tradition and couldnot be changed. Wow, a tradition in only 15 years! But the emotionalinvolvement was a surprise, especially from a scientist. So here is the issueat hand. Extrasolarplanets are currentlynamed in order of discovery using lower-case letters of the Englishalphabet. For example, we have the first extrasolar planet-mass bodiesdiscovered around the pulsar PSR 1257+12 and they are named PSR 1257+12-b, PSR1257+12-c, and PSR 1257+12-d in order of discovery. (?a? is reserved for thecentral star.) This has worked out well for this stellar system since theplanets happen to also be in order of increasing orbital period (i.e., distancefrom their star). Now,we also now have Gliese 876-d, Gliese 876-c, and Gliese 876-b which is thecorrect order from the star, but in this case the outer planet (?b?) wasdiscovered first, followed by the second farthest (?c? ), followed by theclosest planet to the parent star, Gliese 876-d. The star HD160691?s planets(discovered so far) are, in order of distance from their star, HD160691-d,HD160691-e. HD160691-b, and HD160691-c. The planetary system 55 Cancri is reallyfun ? there the planets, listed in order from their parent star, are 55Cancri-e, 55 Cancri-b, 55 Cancri-c, 55 Cancri-f, and 55 Cancri-d. You get theidea. Each planetary system preserves the historic order of discovery in theirnames but tells us nothing astronomical about the planets, or their properrelationship to each other. In addition, it seems like it could create quite aconfusing situation, after many planets are discovered. Perhaps akin to whatGreek or Indonesian children must have to go through when learning thegeography of their country?s thousands of islands. Mysuggestion, which was not adopted, was that each planet be named for itsstellar parent as usual, but then be designated by its orbital period in days,to one decimal point . The orbital periods may certainly be expected to beconstrained to within a tenth of a day or so. No two planets could be confused(unless there are Trojan planets which share orbits but may be rare, and at anyrate might have the additional unambiguous designations of i and ii, asneeded.) Thus we would have Gliese 876-1.9, Gliese 876-30.9, and Gliese876-60.1. Those with a bent for history would have to look up the discoveryorder, instead of the astronomer having to sort through a list of letters tofigure out which is the one to observe for a transit or radial velocity data. Similarlywe would have 55 Cancri-2.9, 55 Cancri-14.6, 55 Cancri-44.3, 55 Cancri-260, and55 Cancri-5218. Now why make such a fuss about this now (if writing an articleabout it can be considered a fuss)? 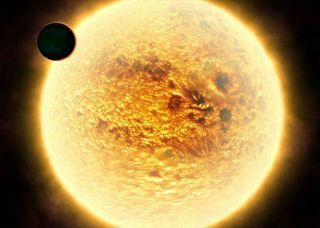 Over 340 extrasolar planets have alreadybeen discovered and things have seemed to work out OK so far, right? The reasonis because current space missions may soon discover thousands of additionalplanets as well as many more smaller planets than in already known planetarysystems. Some space missions will be able to detect Earth- or even Mars-sizedbodies. If our Solar System is typical in terms of having eight or more planetsto a system, then there could be designations consisting of combinations of theletters b, c, d, e, f, g, h, and i! And all sorts of permutations on thesecould occur. We could get: (star name)- b, g, f, d, e, h, i, c or (starname)-e, d, i, b, h, c, f, or any other of the 46,233 possible combinations ofeight letters taken one, two, three, and on up to eight ways at a time. Thepossible combinations go up as the factorial of the number of planets so thingsdo not really get ?bad? at one, two, three, four, or even five planets to asystem (still only 120 possible combinations ? on the order of learning thestates of the US). But as one gets up into six or more planets to a star systemthe possible combinations really begin to take off. Andthis is just the start of the fun. If we consider multiple star systems?wherestars are usually designated by the capitols, A, B, C, etc. ?we get situationswhere, for example, alpha Centauri A-b is a planet, while alpha Centauri B-a isa star. (The "a" designation would, of course, not be used unless aplanet is discovered and then the "a" for the star is implied, usingthe present nomenclature.) Let's look at the 6-star system Castor (alphaGeminorum) where we actually already have the stellar components named Aa, Ab,Ba, Bb, Ca, and Cb. (The second components of close binaries are referred towith lower case letters in these cases.) These are each star names, but if aplanet was discovered about star Ab it would, by the current nomenclature, bedesignated alpha Gem Ab-b, while a second planet would be alpha Gem Ab-c.Similarly, planets discovered around star Bb in order would be alpha Gem Bb-b,alpha Gem Bb-c, and so on, and planets discovered around alpha Gem Cb would bealpha Gem Cb-b, alpha Gem Cb-c, etc. So in this case alpha Gem Bb is a star,even though the first planet around the double star 16 Cygni B is 16 Cyg B-b. Iguess the hyphen would be the only way to tell. Wouldn't it be easier, if threenew planets are discovered around alpha Gem Bb, to have the designation besomething more like alpha Gem Bb-12.3, alpha Gem Bb-20.2, and alpha Gem-43.6?Incidentally, double star systems are not rare?more than half of all stars arein binary systems. Again,I don't want to ruffle any fur, but with thousands of new extrasolarplanets down to terrestrial-body sizes being discoverable within the nextdecade or so, shouldn't we be taking stock of our existing nomenclature? I knowthe IAU commission on naming celestial objects is very diligent (and very busy)and so hope they have considered (along with other extrasolar planets astronomers)some of these possible permutations. You can see further interesting suggestions for nomenclaturein Wikipedia. I shall leave others to do the possible combinatorics andnomenclature for future multiple star system planet discoveries for up to eightplanets around each of the stars in, say, a triple star system. The number oftriple star systems is non-trivial. NowI must add that this is not the first time astronomers have run into troublewith confusing nomenclature (aside from the usual beginner?s confusion overlarger magnitude numbers referring to fainter stars, and things like that). Thehistoric names of variable stars is particularly amusing. A gentleman namedFredrich Argelander decided that the first variable star in a givenconstellation would have the designationR put in front of it. He chose R because he knew the earlier letters in thealphabet were already being used (for multiple star systems, for example, asnoted above). But he also felt that there could certainly be no more than 9variable stars per constellation. Unfortunately, he was off by thousands andthousands. After R of course came S, continuing down the (English) alphabet toZ. Rather than going back to A the designation that follows Z was then dubbedRR, then RS, then RT on down to RZ. For example, I've done work on theeclipsing variable RT Andromeda. After RZ comes SS (not SR, by the way),followed by ST, on down to SZ. Then comes TR to TZ, and so on down to ZZ. (ZZCeti is a famous star, for example.) OK, now what? RRR? Well, no. Itturns out that after ZZ comes AA (which apparently would not be confused withdouble stars using Aa since in this case the letters are both capitals). Thencomes AB, on down to QZ finally, skipping the letter J for some unknown reason? maybe to keep us on our toes? Since there are thousands of variable stars ineach constellation (the number of which, of course, grows all the time) the 334variable names possible with this system (up to QZ) was clearly not going tokeep up. OK, so now would it be time for RRR? Alas, no. Astronomers gave upafter this and began to use V335, then V 336 and so on, with the "V"for variable star. Might have been good to think of this ahead of time butafter all is it all part of the rich tapestry of the history of astronomy,right?? Now,back to extrasolar planets. Why would current astronomers prefer letterdesignations (not dissimilar to what early variable star folks used) ratherthan numbers that would mean something more astronomical? Would planetaryorbital periods, for example, change? I would assert that most planets wouldnot be changing their orbital periods by a tenth of a day or more overthousands of years but special nomenclature might be noted (similar to the i orii above) for such rare cases. Thus with planetary orbital period designationswe might hope to avoid impending nomenclature confusion by using numbers thatalso mean something astronomically, (with apologies to science historians, ofcourse). Finally,an example of smart nomenclature, I have always felt, was the inclusion of theposition of the star system in the name, like BD 16 + 516 and the pulsar systemgiven above, PSR 1257+12. In this case the first number is the rough RightAscension (i.e. essentially the star?s longitude on the map of the sky) and thesecond number the rough Declination (essentially the star?s latitude on the mapof the sky). So, by only seeing the name it can be determined if these starsare "in season" and observable at night at this time of year, as wellas if they are high enough above the horizon at a given observatory. It is truethat stars change position according to the processional motion of the Earth?srotation axis, but this has not been a problem because the designation is socoarse?precession is a rather tiny effect over a century. Withinthis decade we may expect to discover thousands of new extrasolar planetswhich, using the current designation, could produce tens of thousands ofpossible (and frankly essentially meaningless) letter combinations designatingthem. Therefore I humbly make a suggestion to my fellow astronomers: it is nottoo late to bail on this system (as "traditional" as it is). We maynot want to go through the variable star experience of the 19th Century againin spite of its rich historical tapestry. But if we do, I guess I can alwayspractice on Greek or Indonesian island names. And when I think of this as anemotional issue, what will happen if astronomers start to discoverPluto-like bodies around other stars? Are they going to be planets withletter designations or dwarf planets with other designations? I think, as theysay in England, I'll give that one a miss.